In the last few years, a number of options of how to combine grid graphics (incl. 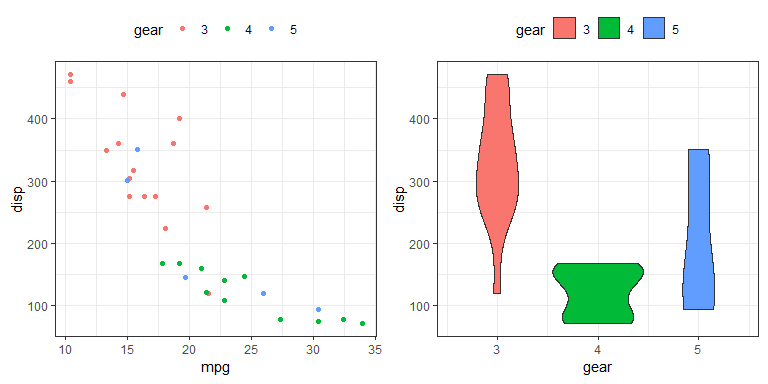 ggplot2) have emerged. If you can't remember all functions to do this, this post may serve as a reference guide, but it's mostly for me because I keep forgetting the functionalities provided by cowplot and patchwork packages (thank you Jaap). Here appearing in order I encountered them. Here is oldie but goldie from Baptiste's gridExtra package. You can, for example, specify the layout matrix or specify number of columns. The below code chunk is using ggplot2::ggsave which saves the last subplot only, which is why I saved the result of grid.arrange into a new variable (but see cowplot below). Next is cowplot, which comes with nice vignettes. What I like about this package is the elegant adding of letters to subplots, e.g. See the vignettes for more information. Package also packs its own ggplot which masks the function ggplot2::ggsave (read: ggsave from package ggplot2). The beauty of it is that it saves the gridded plot, not the last (sub)plot. Thomas did a great job of making combining of plots trivially easy. The GitHub repository of the package is a rich source of information and I could never do it justice. Here's my botched attempt of just an example of what the package functionality provides.